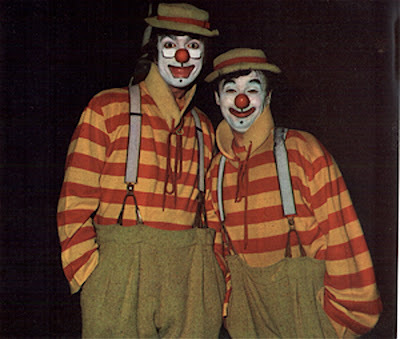 Thanks go out tonight to the Clownfest folks, Greg and Karen DeSanto, Leon McBryde and Jim Howle for a wonderful evening of rare clown video and an even rarer opportunity to hear Leon and Jim's first hand road stories of those days when the "traditional" Ringling Alley was first mixed with these new, so-called "Clown College" graduates. 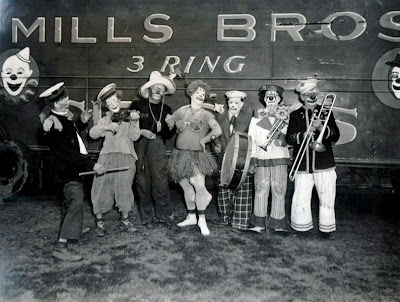 "And a great time was had by all..."
I grew up in Plainville, CT. As you may remember, Ringling played there quite frequently during the 1950s. 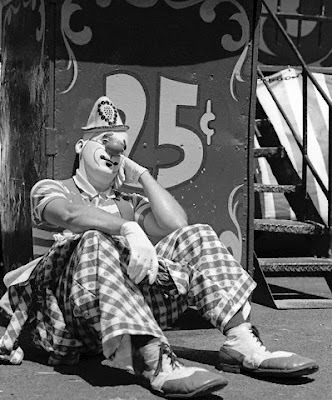 They wanted to tap the central Connecticut market but couldn't return to Hartford because of the bad feelings caused by that devastating circus fire in 1944.So I grew up watching Ringling almost every summer, and I guess I got hooked. 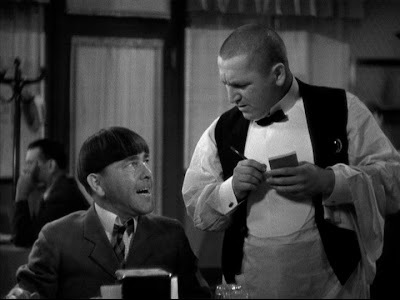 And when I struck up a friendship with Gene, that made it even sweeter. I often wonder when Gene passed ... and where he is buried. The last address I had for him was a trailer park in La Puente, CA. Do you happen to know any details of his last years? 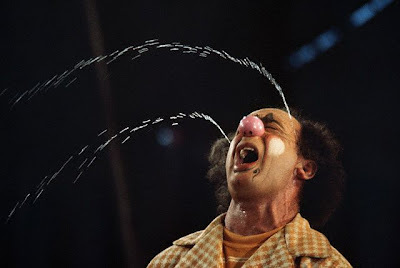 As a youngster, Gene really fascinated me. We became penpals and this correspondence lasted over ten years. 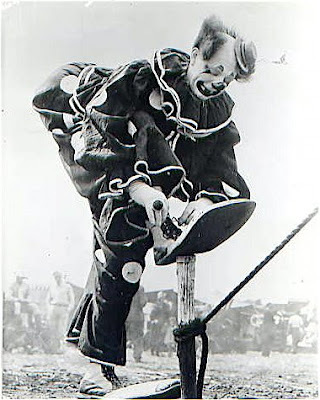 I had hoped to become a circus clown some day - just like him! Now I'm 63 years old. 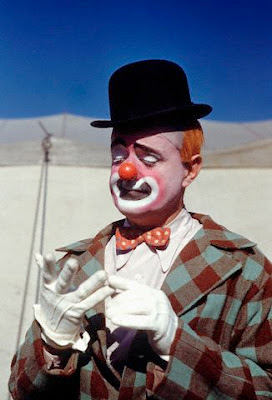 I didn't become a clown, but I was an actor for 15 years and I often think Gene had a great deal to do with this. The last time I saw Gene was at the old Madison Square Garden in the late 1960s. By then was in college and had decided to try acting. 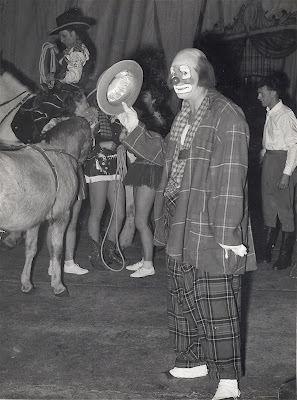 Gene was so happy for me ... he was always telling me to get as much education as I could and I think he thought acting was a much more "respectable" profession than clowning ... although I'm not sure, even at my age, I could ever agree with that. 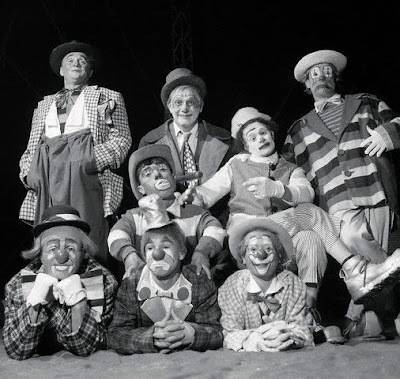 I think the great clowns of the world are the supreme artists of our time: Otto Griebling... Emmett Kelly... Felix Adler... Lou Jacobs... all brilliant! Gene was born in Bloomington Indiana (or Illinois?) 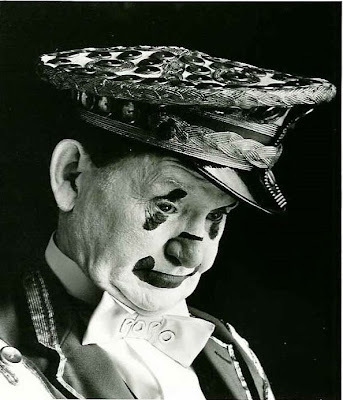 He was in vaudeville with a guy named Frank Faylen who later went on to have a movie career. 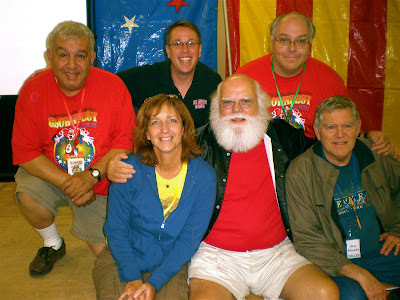 Faylen's most famous role was the taxi driver in the Christmas classic "It's A Wonderful Life". 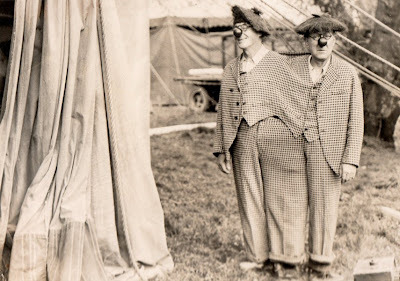 When vaudeville went bust, Gene joined the circus and Frank went to Hollywood. 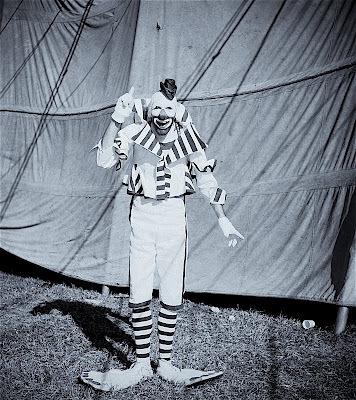 I'm just wondering if you knew Gene during your years with the circus. 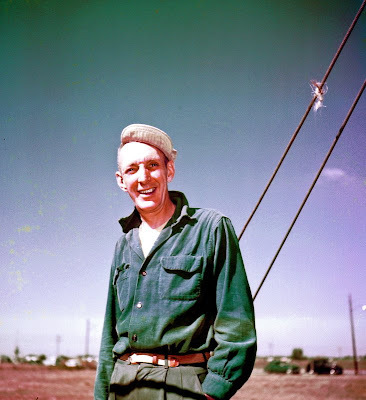 Any information you could give me about his life and personal history would be greatly appreciated. Hi, Rick! Sure! I knew Gene very well! A really terrrific guy! 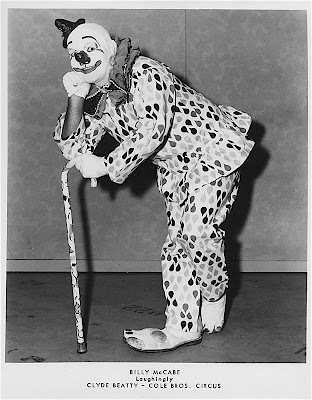 I was on the Ringling show from 1955 thru 1961 - seven full seasons in all. In fact, I met my wife there! 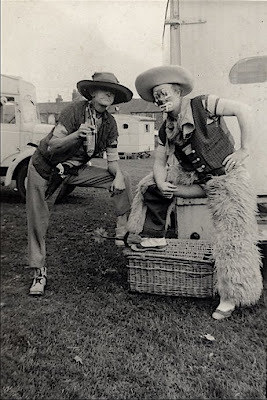 Gene had a trailer in a little trailer park with lots of other circus people close to downtown and I frequently saw him in off-season, as well! 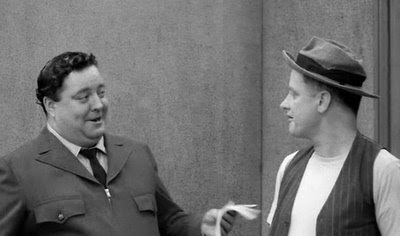 I know he was in vaudeville with Frank Faylen because whenever we played Madison Square Garden, Frank would visit a few times each year. Both gentlemen ask that if anyone out there has more information on Mr. Lewis (Jackie LeClaire, we're looking at you. 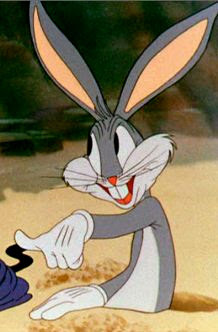 sir) to please step forward and share it with the group! 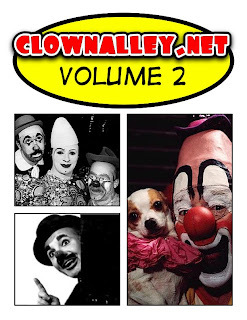 CLOWNALLEY.NET DVD VOLUME 2 NOW AVAILABLE! 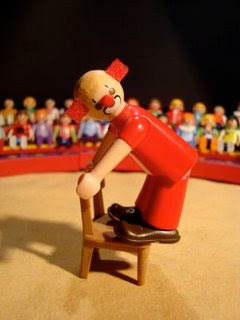 The second in the series of clownalley.net compilation DVDs is now at the plant being duplicated and I've been told will be ready to ship starting tomorrow. To order a copy from eBay, please click here. I'm not going to say anything about it this year. This is the first anniversary of 9/11 where I haven't had my skin crawl all day from the memories. It looks like Nicholai's son, Mike's brother Sacha Coco down front. The long legs, most likely used as the blow-off to the Balloon Chase. 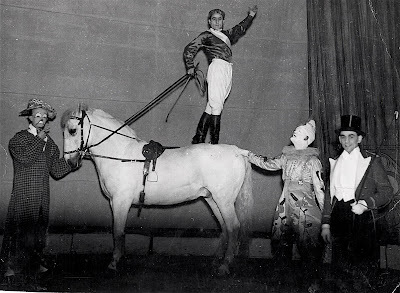 grotesque whiteface in the history of the American circus. 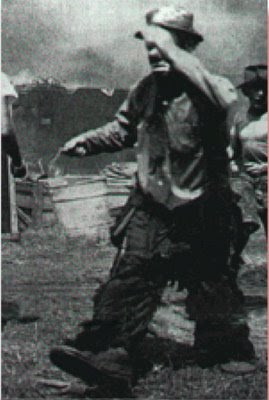 I'm pretty certain that this is one of the Austins, can anyone confirm or deny that this is Alby? 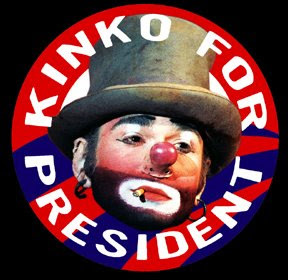 Never before has there been a presidential candidate that so desperately needed change! 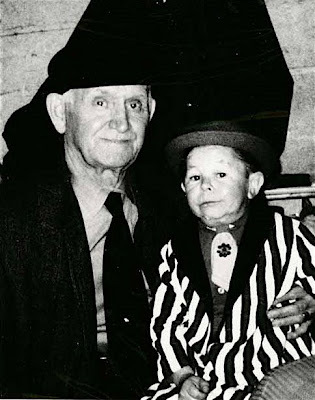 Amleto Cagna and his son Ginetto were among the clowns of Circorama Orfei in Italy in the late '60s-early '70s. 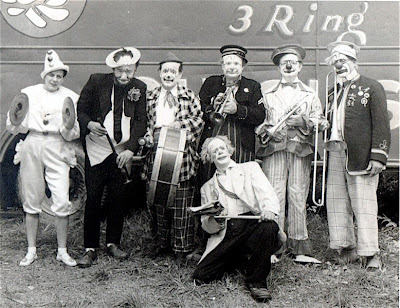 I remember perfectly their act: they were some of the very first clowns I saw in my life. 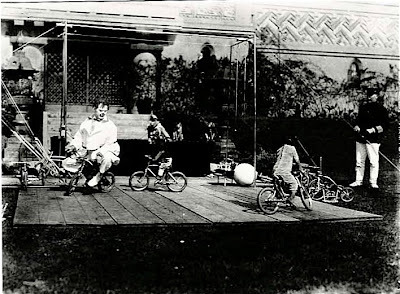 This picture comes from the Circorama Orfei program magazine of 1971, the same year Fellini filmed them there. Amleto, today 86, works in a café in his hometown, Parma. 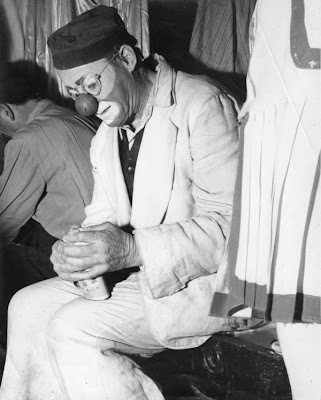 The "King of Clowns" pauses to tie his king-sized clown shoes. 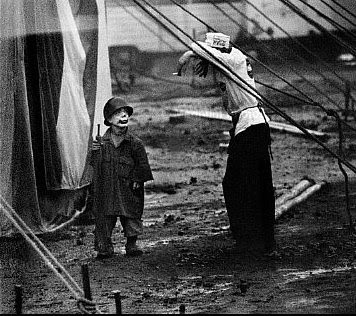 Jimmy Armstrong prepares to perform the Army Gag on a miserably wet afternoon on the Hamid-Morton, Clyde Beatty-Cole Bros. 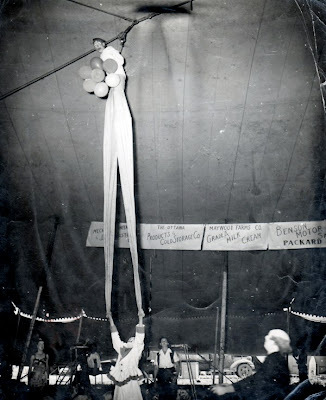 Circus at Palisades Park, NJ in 1959. 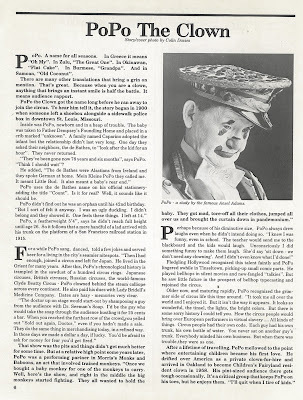 The Popey trio of musical clowns. 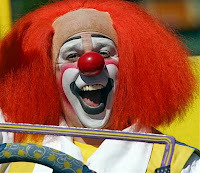 MORE OF THE CLOWNALLET.NET GARAGE SALE! New eBay items listed today! A giant Charlie Rivel puppet as part of the Festival of Cubelles, Spain, the city of Rivel's birth. 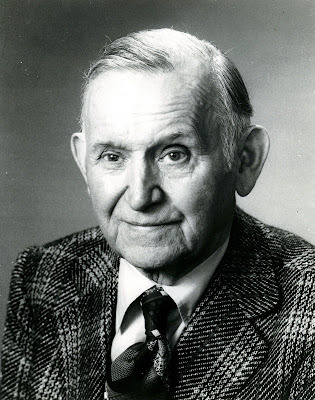 Gerard Vicaire opened his shop in Paris in 1931, closing it in the early 90s. 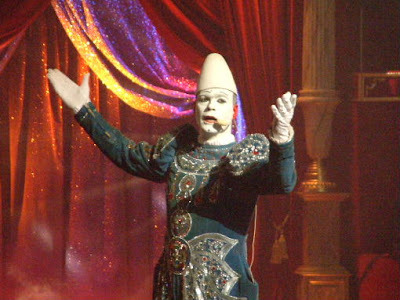 All the European white clowns of the time had costumes made by him. Few years ago, the historian Genis Matabosch from Spain designed in Barcelona a wonderful exhibition in collaboration with Mr.Vicaire himself. 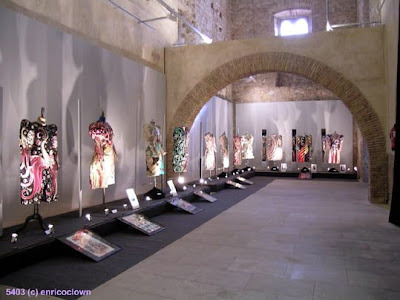 The exhibition is still displayed sometimes. It was put together recently at the Albacete festival last Spring. 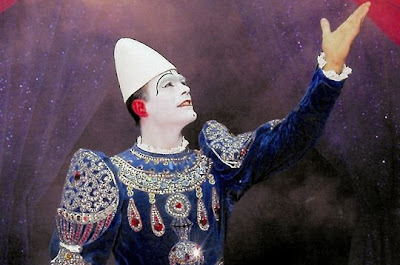 A wonderful catalogue is available, with all the designs, sketchs and photographs of the Vicaire costumes and clowns. wearing his uncle Francesco's marvelous costumes. The new show there is expected to open in October, running thru March. 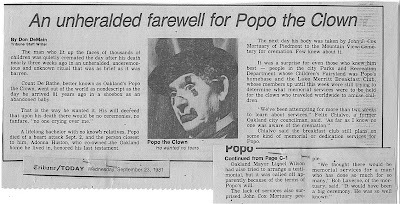 Besides nurturing some of the finest puppeteers in America (Bob Mills, Jerry Juhl, Luman Coad and Tony Urbano just to name a few), the little kiddieland park in Oakland, California known as "Oakland's Fairyland" harbored a grand traditional whiteface clown who quit the road to settle down in Herb Caen's Bagdad-By-The-Bay. 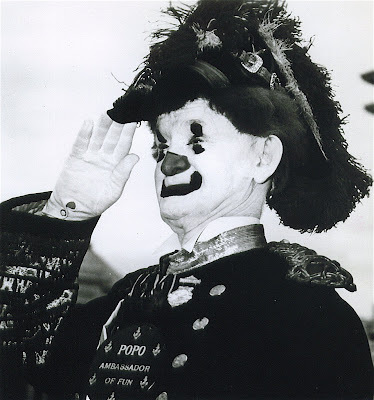 Count PoPo De Bathe was a fixture not just at Fairyland but various San Francisco department stores of the day, including Macy's and The White House. 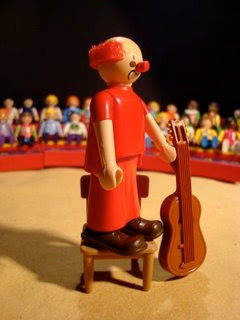 He was a veteran UNICEF entertainer whose Punch & Judy work was second only to the legendary Jay Marshall, who incidentally built PoPo's set of P&J puppets. I've seen him in several pics on your site, albeit unidentified. Now you know who he is! 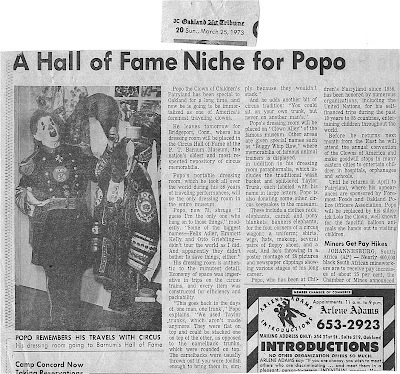 A 1973 article stating that his props were sent to the Barnum Museum in Bridgeport, CT.
Ladies and Gentlemen, Count PoPo De Bathe! 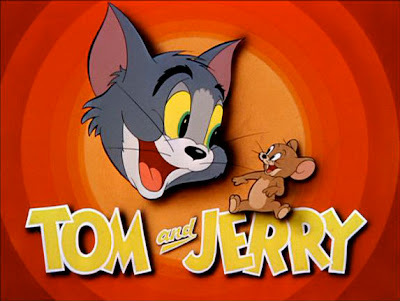 I'm sure someone out there knows who these two are.